Sorry about the strange post yesterday. I had some trouble (baby, browser, touch screen, time anxieties) and the email was sent with half with the post I meant to use, and half this post. Dark Side Oats on the website is how it is supposed to be, as is this post. Writing the last few posts I have decided we need to build a foundation and a shared understanding of flavor development. The very basics of flavor development start with the five tastes and build from these concepts. This is a brief overview with just enough information to awaken your taste buds. From here we can use recipes to discuss how these tastes balance each other and can be used to build the flavor and feeling you are seeking in your dish. There are five recognized tastes in American food language: Saltiness, Sweetness, Sourness, Bitterness, and Umami. While most of these are prevalent in vegan food, Umami can be hard to find, and define. Without the proper balance, and enough Umami a dish will “taste vegan.” That is one phrase I hate to hear. These are the building blocks to make that phrase nonexistent. I think we all know and understand salty. It is one of the most recognized flavors and everyone knows what it means. We all know that delightful feeling of a salty chip hitting your tongue, the pleasure, and then the desire for a drink of water or something sweet to play off the saltiness. Saltiness is easy to add with the most basic addition of salt. There are other ingredients to use for salt if a direct application is not appropriate, or you need another element to balance other aspects of your dish. Think soy sauce, salted nut butters, even pickles or olives. Sweetness is also an easy one. Think cake, cookies, fruit, and sweeteners such as sugar. Sweet is a taste we love in America, much to our detriment at times. It is also a taste that helps to balance and bring out other tastes in our food. If you have too much saltiness you could add a little sweetness for balance. Or, as is becoming more and more trendy; adding saltiness right to your sweetness to balance it out in one bite. Think salted caramel anything, or sea-salt chocolate bars. Sweetness can also balance bitterness (sugar in your coffee), and sourness (sweetener in lemon-aid). Sourness and Bitterness can be confused, but are distinct. Sourness is citrus such as lemons or limes, and vinegar. There are other sour flavors, but those are the most common. Sourness adds brightness to dishes and starts to wake up your palate. It is a good addition when a dish is feeling a little dull. 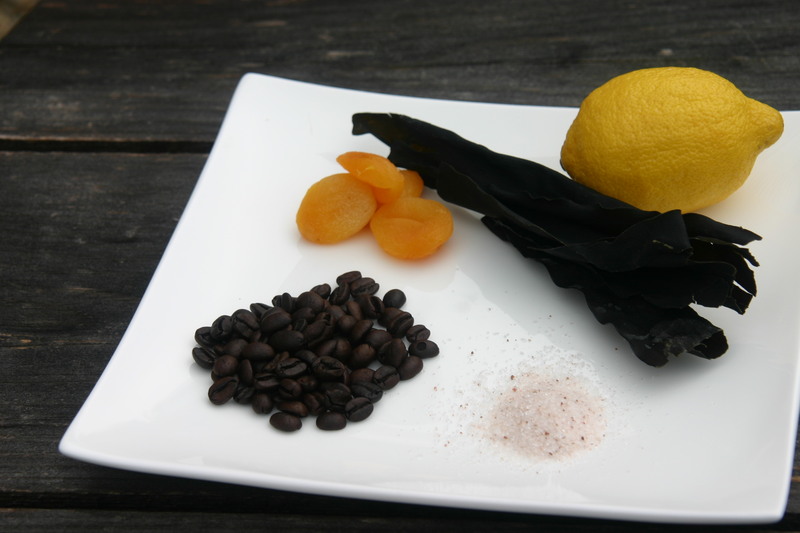 Bitterness is coffee, unsweetened chocolate, radicchio, or charred greens. Bitterness is a wonderful as accents, and can bring out other tastes, or be highlighted alone. Few people want a plate full of lemon slices or even unsweetened chocolate, but most appreciate bitter aspects in a dish. An example of how to tame bitterness comes from the things we add to coffee. If you want to tame the bitterness of coffee you add sugar, or cream, or both. Both have a bit of sweetness to them and mellows out the bitterness and makes it more palatable in large amounts. To balance bitterness you would add separate and distinct tastes. A good example is a salad with bitter greens. You will have the bite of the bitter green, but you don’t just want those. You want to add something sweet like fruit, and sourness like a vinaigrette. Your plan would be to get the three tastes in one bite, or at least close together for an exciting, yet balanced, dish. This is a word derived from two Japanese words meaning delicious and taste. With this meaning, it is directly apparent why we need this taste in our food. Umami is the rich taste that can often be missing in vegan food. It is actually surprisingly easy to add, but you have to think about it. When you taste a dish with Umami you want to go back for more, and it often draws an emotional response from you for the food. There is a lot to know about Umami, but the most important is that Umami is vital, and can be added using ingredients such as mushrooms, seaweed, some vegetables such as tomatoes, cabbage, onions, and avocado, nutritional yeast, soy sauce, and other fermented foods. Non-vegan foods high in Umami include meat, cheese, fish, and fish sauce.